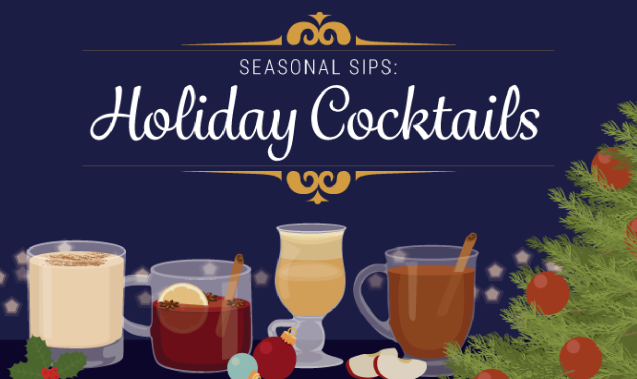 Festive Cocktails for the Holidays #infographic ~ Visualistan '+g+"
There’s no season during the year that calls for cocktails more than the holidays. Family are arriving, a little time off work is beckoning, and it’s time to get a little silly while counting down the days until Santa arrives. But we aren’t just going to be drinking our standard manhattans and martinis. No. The holiday season merits something completely different. You’re going to want cocktails that are somewhat goofy (perfect to pair with your crazy sweater), warming (due to the cold weather outside), rich and decadent (who cares about getting a little belly – it’s sweater weather), communal (what with everyone visiting), and boozy (again, a little time off is just around the corner).